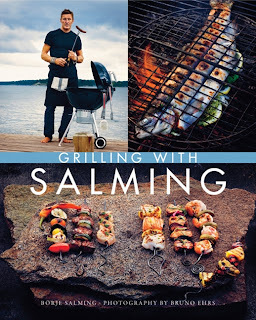 Just in time for the summer BBQ season, here comes Borje Salming with his own cookbook! The Swedish "King of Barbecues" has put together Grilling With Salming where he cooks up steaks, fish, veggies and even deserts. I'm not sure if there is any Harold Ballard egg recipes. This book will test the theory that any book somehow involving the Toronto Maple Leafs will succeed. With the promotion machine behind it, I suspect the book will sell well.Speaking of the marketing machine, you can meet Borje Salming at a book promotion event on May 19th at the Indigo Books store at Toronto's Eaton Centre. Grilling with Salming follows the King as he tackles steaks, fish, veggies and even desserts. Not only does he share his favourite recipes with us, he also talks food and hockey memories, from both Sweden and Canada. He is just as proud of his Lapp heritage as he is of his status as an ice-hockey legend, and this book combines both northern Swedish and North American cultures, spiced with a good dose of Salming’s unrivalled fighting spirit. As he puts it: “One thing I learned on the ice was, he who dares, wins. The same thing applies to barbecue. The more you barbecue, the braver you get!” For hockey and bbq fans, this book scores.